1. Are you going to celebrate New Year? kun jà bpai chà-lăwng bpii-mài mái? ‘Yes-No’ Question Format: statement + มั้ย mái? 2. Where are you going to celebrate New Year? kun jà bpai chà-lăwng bpii-mài tîi-năi? ‘Where’ Question Format: statement + ที่ไหน tîi-năi? 3. With whom are you going to celebrate New Year with? kun jà bpai chà-lăwng bpii-mài gàp krai? ‘Whom’ Question Format: statement + ใคร krai? Note: “ใคร krai” is used for both ‘who’ and ‘whom’. 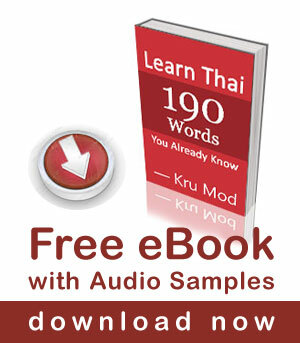 If it is used for ‘who’, ใคร krai will be put at the beginning of the sentence. – Who will take you to the party? krai jà paa kun bpai bpaa-dtîi? – With whom will you go to the party with? kun jà bpai bppa-dtîi gàp krai? 4. Where are you going for New Year holiday? 5. What are your plans for next year? bpii nâa mii plaen à-rai bâang? You can also easily change the first four questions to “past tense” by removing the word “จะ jà” that is used to form future tense. 1. Did you go to celebrate New Year? kun bpai chà-lăwng bpii-mài mái? 2. Where did you go to celebrate New Year? kun bpai chà-lăwng bpii-mài tîi-năi? 3. With whom did you go to celebrate New Year with? kun bpai chà-lăwng bpii-mài gàp krai? – Who took you to the party? krai paa kun bpai bpaa-dtîi? – With whom did you go to the party with? kun bpai bppa-dtîi gàp krai? 4. Where did you go for New Year holiday? Happy New Year to you too. Many thanks for all your helpful videos. They are always enjoyable and much appreciated. Another very helpful lesson! Sa-wat-dee bpii mai! Khorp khuun krap!